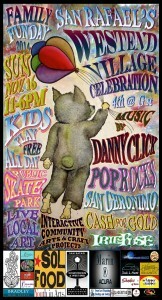 Youth in Arts will be offering free family art activities at the West End Village Celebration “Family Fun Day” on Sunday, Nove mber 16, from noon to 6 p.m. in downtown San Rafael. Join us on 4th Street between G Street and Shaver–we’ll be creating planetary images for our mural inspired by the James Hetfield quote, “Dream big and dare to fail.” The finished mural will be displayed in our YIA Gallery in an upcoming Spring exhibit and then installed somewhere in Downtown San Rafael as part of the Creative San Rafael project. Bring your children of all ages to help add to our mural! The West End Village Celebration street fair will also include great local food and live music. So come down and enjoy a free day of family fun produced by the locals, for the locals.